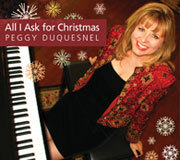 PEGGY DUQUESNEL is pleased to present her latest recording, " All I Ask for Christmas," a double album with 21 tracks separated into an instrumental disc and a vocal disc. The project features several popular Christmas standards along with four of Peggy' s original Christmas songs. It highlights her fluid piano improvisations and inviting vocals with a trio that includes Brian Bromberg on bass and Joe La Barbera on drums. Extra finesse and colors are added by Brian Kilgore on percus-W. Rick Braun on flugelhorn and Jay Leach on guitar. Vocalist Bill Cantos is featured on three duets with Peggy, including the title cut, as well as introducing vocalist Emma Werderman, who joins Peggy on Mary Did You Know for another moving duet. Duquesnel' s jazzy / pop arrangements and songwriting capture her eclectic jazz background and warm personality.